Skull & Bones was one of the surprises of Ubisoft's conference. Take the team who developed the naval fights of AC3 and AC4, add a lot of multiplayer, and you get this game. Why not. Images and CG trailer inside. 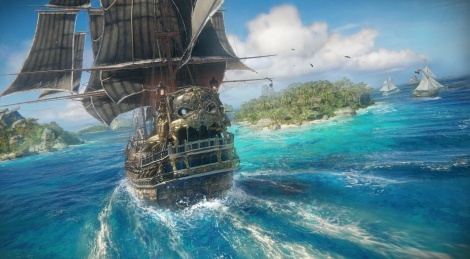 Skull & Bones looks fantastic, both in visuals and gameplay wise. I loved the naval exploration and combat in Assassin's Creed 4 and Rogue. Was very exhilarating to fight multiple enemy ships at once and come out on top with just a sliver of health left. Rogue's Legendary Ship battles were great as well. Very, very difficult, but definitely worth the effort. And when you're done, you truly feel like the master of the seas. This looks like it gets all the best elements and just polishes them even further. Hopefully, there's a proper and lengthy Story mode alongside the Multiplayer. For those that prefer to play Solo. PS. Was it just me or during the demo, one of the commands to one of the Raiders' ships was "Go inland." Could this have a "on-land" aspect to it? If it does, that would make this even greater. Ugg MP only? Pass from me. Not only that which is offputting, horrible UI (energy bar on ships, seriously? ), physics of the cannon balls looks terrible and unrealistic and what's with the weird glowing fire on the cannonballs? I loved Black Flag especially the ship stuff but looks like the developers have completely missed the point about what made that great and have made a stupid arcade multiplayer game.